Find places to go horseback riding in PA. 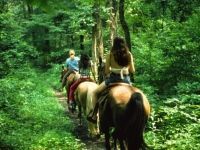 The Best Horseback Trail Riding in PA! About 50 miles northeast of Pittsburgh and nestled on 125 acres of farmland in the hills of Western PA, Happy Trails Equine Center is a family-friendly barn that believes in providing a warm and welcoming environment to all its customers. All trail rides are guided to ensure safety. Ride two hours over challenging terrain, through the woods and over water. For beginners, the 1-hour rides will pose much less of a challenge. Happy Trails offers lessons, summer horse camps, therapeutic riding, and various trail-riding activities for adults and children. Birthday parties, company picnics, and other special events are permissible in the indoor arena. Happy Trails has 11 X 11 stalls for boarding, as well as shavings, evening feedings, and daily turnout. In a camping mood? Pitch a tent in the woods or a cleared space behind the pastures, and sleep under the stars! Happy Trails provides a fire pit, restroom, and shower facilities. Excellent Horseback Riding and Boarding in PA! If you are seeking a topnotch horse farm that takes impeccable care of its horses, Coventry Equestrian Center in Washington, PA should be your premier destination. Coventry is nestled on 32 rolling acres in Southwestern PA. Established in 1993, the company offers humane boarding that'll cover all your horse's needs. Each horse gets fresh water, clean stalls, and four daily feedings. Expect excellent care, a quiet atmosphere, and reasonable rates. The facilities employ first-class trainers, who deliver lessons in dressage, hunter, jumpers, and barrel racing. Choose from several outdoor and indoor sand arenas, as well as miles of horse riding trails. Ride Along Scenic Trails in This Huge Park! This huge 9200 acre park is one of the largest urban parks in the country. 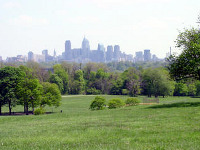 It offers a place of relaxation and recreation to both the inhabitants of Philadelphia and visitors from miles around. If you are an equestrian you'll love the many trails offered at Fairmount. Whether a beginner looking for a leisurely open country ride, or a more advanced rider wanting a challenging terrain, there are trails there for you. Ride along the Schuylkill River, Cobbs Creek and the Wissahickon Creek valley among many other scenic routes. Great PA Horseback Riding for the Whole Family! Ashford Farm is located on 55 acres of rolling hills above the Schuykill River. Only minutes from Philadelphia, Ashford contains a riding stable with three outdoor rings and a cross-country course. This PA horseback riding trail is perfect for families, as it can accommodate both children and adults. The horses are trained to suit riders of every age, size, and training level. Are you looking for a good day camp to send your kids this summer? The Summer Riding Camp is available to children ages 8 to 14. Allow your young ones to learn the basics of horsemanship and riding, within an atmosphere that's both safe and fun. Year-round horse riding lessons for adults and children are also available. The instructors are friendly and approachable, allowing you to gain a greater respect for the art of riding and the horses themselves. 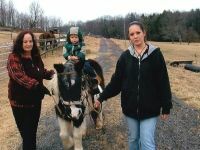 Big Oak Farm & Stables, Inc.
One of the Best Places to Go Horseback Riding in PA! Big Oak Farm & Stables is situated on a lovely farm that stretches across 250 acres. The farm is only about 5 miles from Indiana University of Pennsylvania. Big Oak stables approximately 45-50 horses on over 100 acres of pastures. The sand outdoor arena measures 200 X 150 feet, and the mixed cover-all indoor arena measures 120 X 62 feet. The venue offers trail riding, show jumping, dressage, and equitation. For outdoor practicing, there is a grass arena and a new grass dressage arena in production. In the month of July, Big Oak holds its summer camp, in which children of all ages can learn the pleasures of horse riding. Advance Your Riding Skills at this PA Horseback Riding Trail! 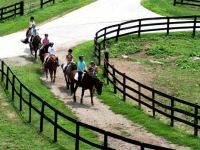 Located in the eastern suburbs of Pittsburgh, Darby Downs Equestrian Center offers facilities for horse boarding, training, and lessons. Horse boarding is limited, as the staff makes sure to give each horse the personal attention they require. Get instructions on jumping, dressage, and eventing from certified instructors. The venue includes a 60 X 120 indoor arena, 60 X 120 outdoor arena, a grass dressage arena, a cross-country course, and 30 acres of rolling hills and pastures. Darby Downs specializes in riders looking to advance their skills, but also offers lesson programs to beginning riders of all ages. Customers are constantly impressed by the hands-on experience they receive from the kind, patient trainers. Schedule your children for one of Darby Downs' fun-filled boy/girl scout programs! An Enjoyable PA Horse Trail Ride through the Poconos! 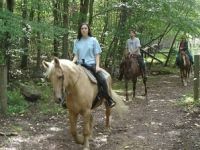 Take a relaxing and enjoyable guided trail ride through the dazzling Western Pocono woods at Deer Path Riding Stables. Deer Path is open to beginners of many ages, and not simply exclusive to advanced riders. The guides are always helpful, and will advise your children on all safety issues. Several youth group programs are available. 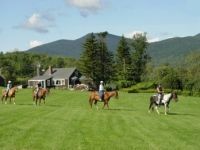 If you're looking to lodge nearby, the PA horseback riding trail is close to Split Rock Lodge, The Mountain Laurel Resort, Jack Frost Ski Area, Comfort Inn, Ramada, and many other hotels. Deer Path is also accessible to many parts of New Jersey. Experience an Old West Style Horseback Trail Ride in PA! 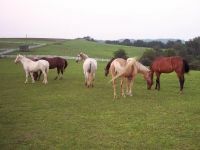 Rolling Hills Ranch is Western PA's premier facility for horse trail riding and boarding. The family owned and operated business has been providing equine services for over 40 years. Whether you're a beginner or experienced rider, there is a trail for you. Experience Rolling Hills' version of the Old West, as you ride along over 70 acres of picturesque terrain. Enjoy authentic western riding under the stars with Rolling Hills' Moonlite Rides. After riding for about 1 and a half hours by moonlight, indulge a catered dinner that includes BBQ ribs, two sides, and soft drinks. Take advantage of Rolling Hills' affordable rates, complete with special family discounts. The facilities can comfortably accommodate large groups for outings, field trips, birthday parties, and other special events. Rolling Hills also offers comprehensive boarding services for your horses, as the company ensures only the best of care for your equines. 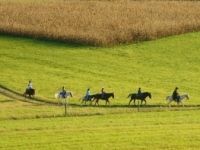 Fun-Filled Horseback Rides in PA Dutch Country! Ride all year round at Allimax Farm in Columbia, PA! Ride one of the expertly trained horses over picturesque fields and trails, accompanied by an experienced staff. Before each ride, everyone will be briefed on all safety rules and practices. Allimax Farm is best known for helping riders increase their knowledge about horses, from traditional PA Dutch horsemanship. You will learn how to control your horse and create a working partnership that'll make the experience twice as enjoyable. Whether you're a beginner or advanced rider, there is a horseback riding package to suit your needs. Horseback riding lessons in Working Western Trail Riding are available to students ages 7 and up. The family and group activities include pony parties, picnics, hay rides, and barbecues. Looking stay overnight in beautiful PA Dutch Country? Stay in one of five bed & breakfasts in the area, including Green Acres and the B.F. Hiestand House. Enjoy Picturesque Scenery on this PA Horseback Ride! Visit Daisy Field Farm, a family-owned horse farm in the Western Pocono Mountains. At this exquisite farm, you will find varieties of horses, farm animals, and wildlife. Horseback riding, trail rides, and other activities are available, as long as you reserve an appointment. Breathe in the fresh mountain air and take in the picturesque scenery during your visit to Daisy Farm. The horseback rides are perfect for all ages and abilities, as everyone is accompanied by the amicable and seasoned trail guides. You can even take a ride on a horse-drawn wagon, led by a wildlife expert and bird watcher. Recommended for children ages 4 to 10, the pony trail rides allow your kids to take a 15-minute adventure through fields and forests. Free picnicking facilities are available on site. Plus, you can greet the farm animals at any time! 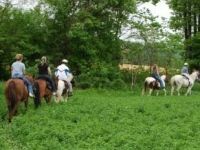 Horseback Trail Riding in PA for Families and Couples! Come participate in the most enjoyable ride in the Poconos with Mountain Creek Riding Stables! Open seven days a week and all year long, there's a wide array of activities for the whole family to enjoy. The most popular one is the 1-Hour Walk/Trot Guided Trail Ride, which allows you to enjoy a slow-paced western ride through a mountain creek and wooded trails. Throughout the trail, you will spot various wildlife as well as deer, wild turkeys, and hawks. No prior riding experience is needed to embark upon this trail. Professional guides, equipped with radios, will accompany you on the ride. For intermediate-level riders, there are 2-hour semi-private rides which include extended trotting, multiple water crossings, and rugged trails. Couples will adore the romantic horse-drawn carriage rides. Also available are wagon rides and (weather-permitting) sleigh rides. A Horseback Trail Ride through Hundreds of Acres! 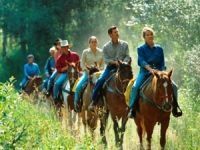 Located in the serene Pleasant Valley of New Ringgold, PA, Pleasant Valley Ranch offers a slew of fun activities including horse riding lessons, guided trail rides, 2-hour moonlight horse rides, hay rides, and campfire rides. The 1- and 2-hour trail rides extend over hundreds of acres of land, with stunning views of Schuylkill County's lush valleys. Trail rides are available by appointment only. The horse boarding services are the finest in the area! Pleasant Valley's "Ranch Birthday Parties" include an educational barn tour, fun with whips and lassos, a tractor-pulled wagon ride, hands-on time with the trail horses, a game of tug of war, and pony rides. During the summer, you can send your children one of the wonderful Horsemanship Day Camps. 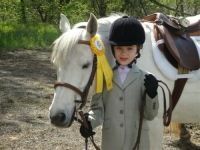 Your kids will learn to groom, tack, and ride their own horses! For ages 8 and up, there are bull riding and bull fighting schools available.